In this part of our exploration of nonlinear work, we consider the effects of interactions between the internal elements of an effort, as distinguished from the effects of external changes. Many of the surprises we encounter in projects arise from internals. Dunlin flock at Nelson Lagoon, Alaska. Flocks of birds, schools of fish, and swarms of insects, among many other biological groups, exhibit a behavior called swarming. 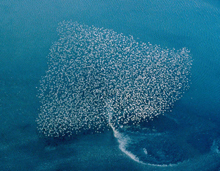 Swarms seem to act in perfect if mysterious coordination. Swarms have no designated leader and no pre-defined global plan. Their behavior is emergent — a group improvisation. As humans, we like to believe that when we act in concert, we usually follow a leader or a plan. My own guess is that much of our group behavior is more like swarming than not. If it is like swarming, then the behavior of projects that seem ungovernable might be a bit less mysterious. If we think of a project and its people as a system, we can regard as external inputs the project charter, the project's requirements, and its resources. Changes in these inputs produce changes in the project's outputs. Consternation and frustration arise when changes in the outputs violate our expectations with respect to changes in the inputs. As we've seen, nonlinear work doesn't always obey the superposition principle. That is, the result of two sets of inputs acting together is not always equal to the sum of the results of each input acting separately. This failure is one reason why our predictions of project results are so wrong so often. Internal interactions within the project can provide another reason for our frustration. Here are three examples of internal interactions whose effects can dominate the effects of any change in project inputs. In the course of development, the project team might discover something that nobody knew or understood before work began. It might be an unanticipated obstacle (bad news), or a wonderful new opportunity (possible good news). Sometimes these discoveries lead to changes in requirements, even though no external agent sought a change in requirements. Whatever the discovery is, it can affect both project performance and project outcomes. And with alarming frequency, these effects can be far larger than the effect of any changes anyone — customer, manager, executive, regulator, marketer — might impose on the project. From this perspective, such changes come from nowhere. absence of surprisessystems, emergence happens when many small identical elements of the system organize themselves into coherent behavior. For example, the organized movement of a school of fish is emergent behavior. Emergent phenomena are also observable in projects or portfolios of projects. When one task encounters difficulty, the consequences of that difficulty can propagate across the project, with the result that many other tasks find themselves in similar straits, resulting in a form of gridlock. This can happen at any time, in the absence of any external stimulus. Even when none of the inputs have changed, mistakes, miscommunications, insights, and creativity can cause the outputs to develop along paths that differ from what anyone expected. This happens because the system contains more internal degrees of freedom than those that are specified by the inputs. We tend to call these unexpected changes "surprises," but the only real surprise in any project would be the absence of surprises. Would you like to see your comments posted here? rbrenJfxmOnKHjDYvKBeUner@ChacHGbUXhnEjXhSNIBloCanyon.comSend me your comments by email, or by Web form. Historically, military logistics practice has provided a steady stream of innovations to many fields, including project management. But project managers can learn even more if we investigate battlefield tactics. Incremental problem solving is fashionable these days. Whether called evolutionary, incremental, or iterative, the approach entails unique risks. Managing those risks sometimes requires counterintuitive action. As we've seen, some cognitive biases can contribute to the incidence of scope creep in projects and other efforts. Confirmation bias, which causes us to prefer evidence that bolsters our preconceptions, is one of these. See also Project Management for more related articles. I offer email and telephone coaching at both corporate and individual rates. Contact Rick for details at rbrenlJvcRpRCLTYcuaSBner@ChacGxuhWdFPbczvStbYoCanyon.com or (650) 787-6475, or toll-free in the continental US at (866) 378-5470.